Sunset Elementary's physical education teacher Susan Nicholson was named Teacher of the Year by the Craig Daily Press Thursday morning. 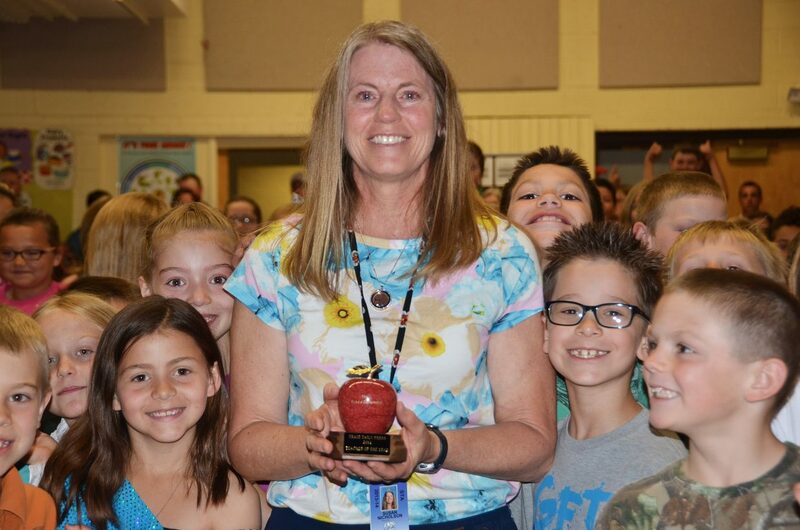 The Craig Daily Press presented its Teacher of the Year Award to Susan Nicholson on Thursday morning, highlighting the good work of a woman who dedicated 28 years of her teaching career to Sunset Elementary School. Nicholson, who is Sunset’s physical education instructor, is retiring this year and won the newspaper’s award by popular vote after dozens of students and community members nominated her for the prestigious honor. Sunset students gave Nicholson a standing ovation when Craig Daily Press Managing Editor Noelle Leavitt Riley presented her with the award. Nicholson holds a huge spot for Sunset in her heart — she attended the elementary school as a child and was able to work with teachers who helped her grow into the woman and teacher she’s become. Although it’s bittersweet, she’s excited to start a new chapter in her life.